George Billis Gallery is pleased to present Craig Carlisle: Relationships, a solo exhibition of new paintings by the artist. The exhibition opens with a reception on December 2nd, 2017 and continues through January 3rd, 2018. ​Springing from the unconscious, Craig Carlisle’s paintings are sentimental reflections in which he continues to explore the ideas of meditation and contemplation. Carlisle's new paintings are a juxtaposition between the delicacy of self awareness and complexity of relationships. The paintings depict images which evoke an emotional response in the viewer - a response that resonates long after the viewing. Carlisle deliberately paints his heads on large canvases at a scale that will command a room - larger than life faces peer out at the viewer, inviting a gaze in return. Each expression Carlisle creates is meant to elicit emotions from one’s subconscious. The heads are typically anonymous and often genderless, almost child-like, and without any specific accoutrements. By depicting the heads thus, Carlisle places the focus for the viewer on the expression of each face, not their personal style. 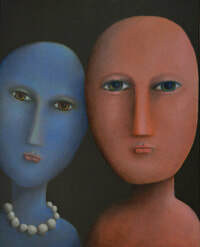 Carlisle began painting his head series in the early to mid 90’s, which established him as a deeply respected artist with a unique vision. Though the heads have seen many expressions and stylistic changes over the past decades, they remain singular works of art. Craig Carlisle (1964) was born in Oklahoma and moved to Ohio where he received his BFA at the Columbus College of Art and Design in 1988. He has lived and worked in NYC, San Francisco, Los Angeles and Columbus. Currently his studio is located outside of Nashville on a 19th century farm. The artist has exhibited in numerous galleries and museums and is highly sought after by art collectors around the world.